Episode 64 - The third and fourth days of the great war. It seems like the tide may be turning somewhat, since both days of fighting were dominated by Arjun and Bhimasena. Despite having the honor of receiving Krishna's teaching firsthand, Arjun still seems to be holding back somewhat. His lassitude gets so bad that Krishna finally gets annoyed with him, and takes matters in his own hands. 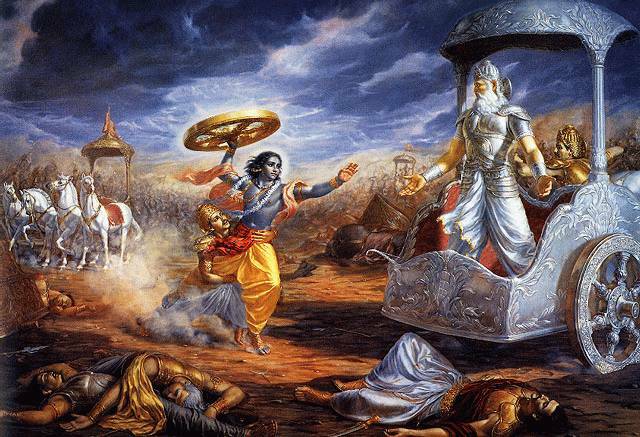 Contrary to the way I've always heard the story told, Krishna does not take any consideration for his oath not to fight, and does not use a chariot wheel as his weapon. Instead, he just pulls out his Sudarshana Chakra, and sets out to destroy the Kauravas in one blow. Arjun does not explain why this cannot happen. He just dives for his friend and tries to tackle him before any damage could be done. Meanwhile, Bhisma is waiting with open arms to receive his lord. Having made his point, Krishna puts out his frisbee and takes up the reins again. Arjun promises to do better next time. But it still seems like he's holding back! Aside from that drama, many heroic feats are performed, especially by Abhimanyu & friends. Also, Bhima gets to make a big showing, fighting off the combined Kaurava forces almost single-handedly, and to top it off, he gets his hands on 14 of his odious cousins and sends them straight to Yama for safekeeping! I've just found your excellent series of podcasts. I've only listened to the first seven episodes so far and I'm looking forward to catching up! Thanks for the great work!